On that recent Edinburgh trip, I took the opportunity to approach the art gallery from North Bridge via the Scotsman Steps. 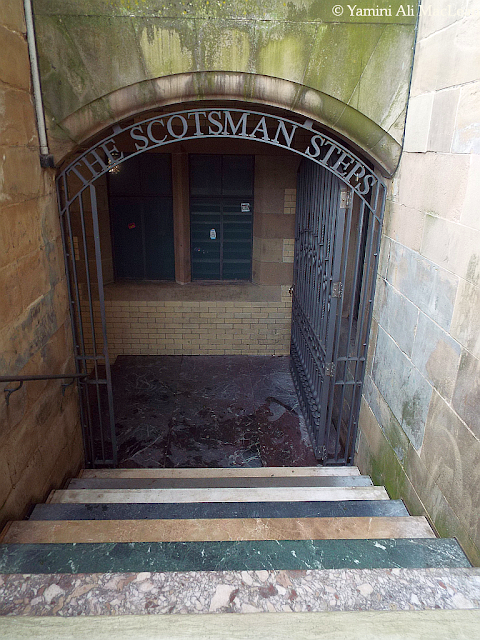 The Scotsman is a newspaper of long-standing in the Bonny Land, and for many years was resident in a beautiful building right beside the South end of the North Bridge. The offices are now in the 'new town' and the building is now a hotel. 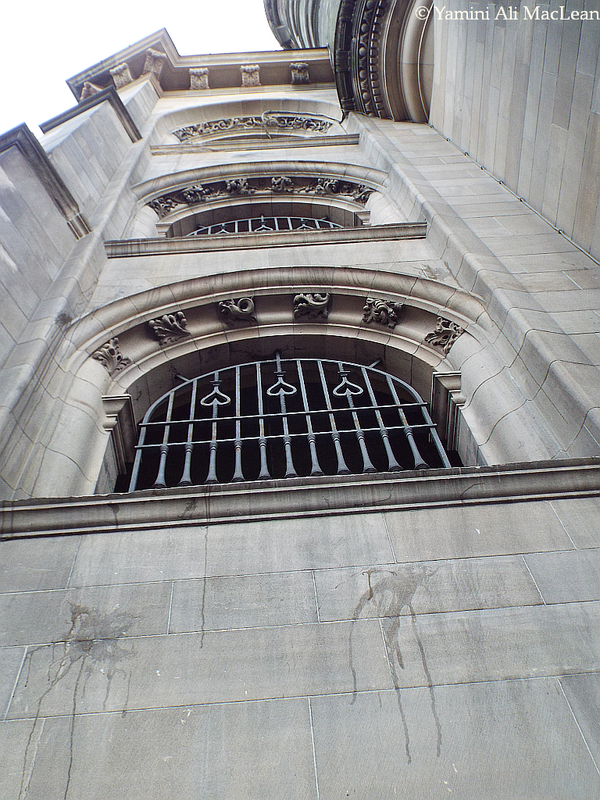 The steps which run down the outside of the building link the upper road to Market Street which runs under the bridge and offers entry to Waverly rail station. I must be very honest here; back in the days when I was previously resident in that ancient city (35+ years - yikes), to traverse those stairs was to take some courage. It was a haven for drunks and used pretty much exclusively as their urinal. Despite regular upkeep by council cleaners, throwing, ammonia cleaners on top of acrid urine didn't really help the situation. 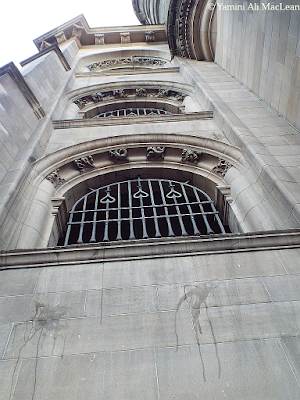 The challenge, then, was to take a deep breath at the top and get down to the bottom without having to breath at all. For this reason, going up was less used... There was also some risk depending on the trajectory one chose, as the sandstone steps had become very worn indeed. In 2011, for heritage, safety, and for keeping tourists onside, a major overhaul of the steps was undertaken. Turner Prize-winning artist Martin Creed undertook the work on the Category A listed "convenience". 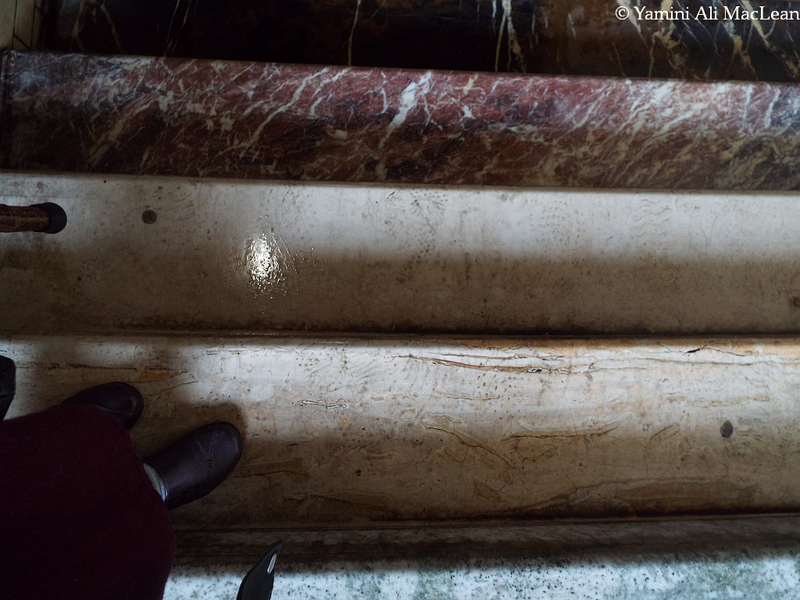 In doing so, he opted to utilise a different form of marble for every step. The 'artwork' is called Work No. 1059. There are 104 different marbles used. The work was commissioned by the Fruitmarket Gallery and you can read more detail (and see better piccies) HERE. As the steps had not long been washed when I went down them on this visit, it became apparent to me that there was still an inherent risk to life and limb - they were slippery! Edinburgh is so full of hidden places and is a joy to explore - if you are fit and healthy, just about everything can be covered on foot. Otherwise, the town is very well served with buses. One of the best bus services in the world - and I've tried out a few! You can travel everywhere on the bus for a day with a four quid tour ticket. It is only necessary to make three separate journeys for that to already make its value and then some. Then there's eating. Countless places, endless variety. 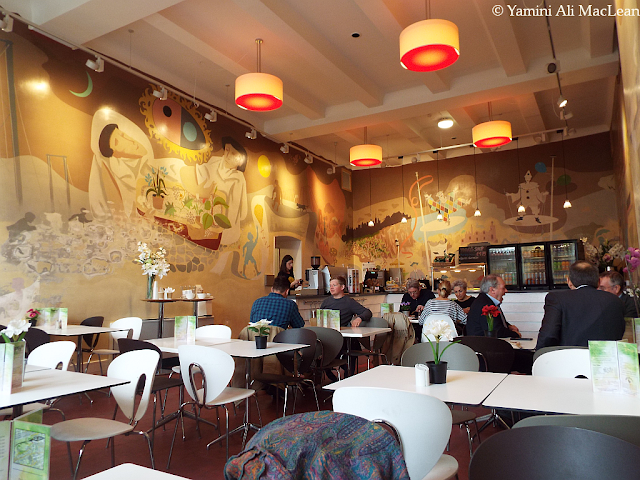 This was the cafeteria at the City Art Gallery. A bit noisy for my taste, but cheap and good baked tattie!!! Oh do I hear and sniff the urinal issue. 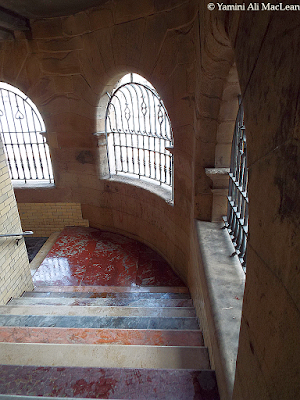 What a pretty stair case though and beautiful buildings. My doctor moved from about 15 minutes away just down the road from our house with tons of free parking to a brand spanking new office in the middle of downtown Raleigh with parking in a deck that was 2 blocks away. It was free parking as was the smell of urine in the stairwells. I finally changed doctors now I have one about 15 minutes away in another direction but tons for parking in a lovely shaded lot with no smell of urine. Wet sandstone is treacherously slippery. My little town, Peninsula, made its living quarrying sandstone, a couple of centuries back. I would be so intrigued by that stairway that I would have to go exploring. The updated ones are beautiful, but slippery is not so good. Thanks for sharing a bit of Edinburgh. Looks like a fun city to explore! We loved Edinburgh! Mind you, we were there in the summer (Fringe time) with beautiful weather. I can imagine getting up and down steps and streets in the pouring rain would be a bit more of a challenge. I love the art of the stairwell...to bad the store is slippery...but so many things are. THe polished concrete floors at work, the lino at the community centre, and I just about broke my neck trying to scrub the mildew and algae off the deck...who knew vinegar can make it so slippery! How gorgeous those steps! I recently saw a "rainbow" painted wooden staircase which I fell in love with, but this one has captured my heart with its elegance. The slippery part is off-putting though, and given the material not something to take casually. I think I'm happy to view them from your photograph. 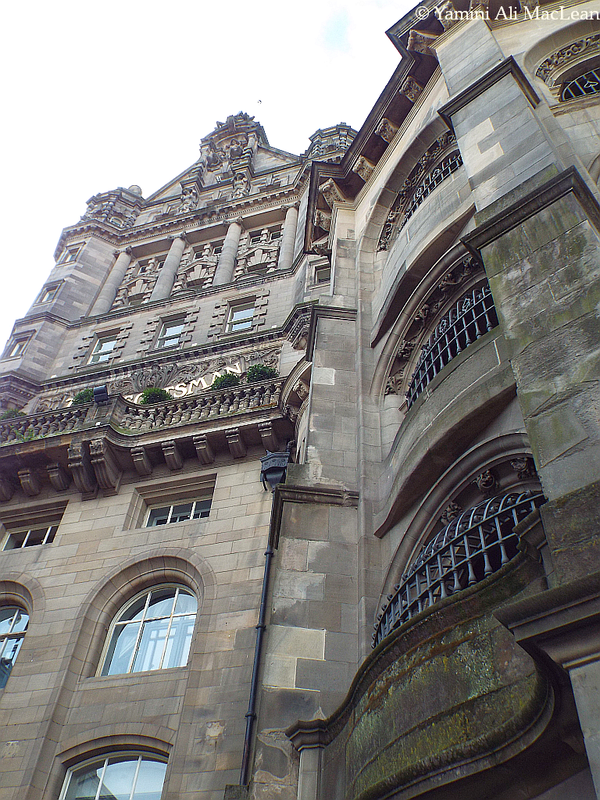 But still, Edinburgh sounds like such a lovely place and one that's on my hopefully-someday list. I think about it every year as I'm enjoying our local version of the Fringe Festival and glad our crowds aren't what Edinburgh's must be then.